If you’ve been traveling with me on this devotional for journey for any amount of time, you’d know that I love God, my husband, my daughters, hot tea with lots of sugar, chocolate, and quiet times at my kitchen table. This week started rough (but is getting better all the time!! 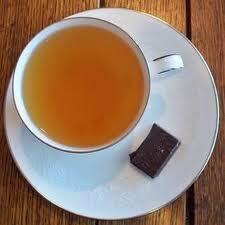 ), and two cups of strong, sweet, hot tea and several mini chocolate bars weren’t helping me through the day. Despite repeated attempts to have the kind of quiet time with God I really enjoy, that wasn’t happening either. I was interrupted or cut short on time or distracted or just incapable of understanding the words I read off the page (read paragraph, reread paragraph, sigh, drink tea, read paragraph again). What I longed for was a God-encounter. I was so thirsty for Him in the midst of stress and noise and I desperately held my cup out for Him to fill at the fountain of Living Water. This time with Him that I adore and that helps me through my everyday seemed so elusive and unfulfilling, but it wasn’t for lack of trying. It wasn’t until I stopped attempting to separate my time with God and simply sought Him as I traveled along that I felt His presence and heard the lessons He was sharing. You can read Lesson 1: My Feelings Can’t Be the Boss of Me here. Jesus told His disciples, “Come away by yourselves to a secluded place and rest a while” (Mark 6:31). He called them to the discipline of aloneness, quietness before God, spiritual retreating from the crowds and activity to spend focused time one-on-one with God. Those are sacred times of purposeful seeking God’s face. I have high expectations for those moments with my Savior and that is precious time to me, time that I guard fiercely. That’s no easy task when you have young kids and a telephone and email and a to-do list! Yet, it’s a battle worth waging in order to see Him, hear Him, feel Him, know Him. Yesterday, though, I kept traveling to my kitchen table and pulling out my Bible and journal, my Bible study book, my devotionals and then sipping my cup of tea, but still walking away unfilled. My cup was held out. I had traveled to the Fountain. I remained thirsty. My cup did not overflow. As I drove around town yesterday, frazzled and tired, that quote was prodding my heart and mind. Oswald Chambers wasn’t advocating not spending time alone with God. He wasn’t saying, “Forget trying to read your Bible and pray; it’s not important.” It is important. That time is necessary and life-giving. Yet, it is also not a vending machine where I make an investment in time and pay the required amount (quiet time, study materials, journal, tea) and receive in return treats and goodies (peace, feeling close to God, receiving inspiration, having something great to write in my journal). There’s that danger, always the danger, of making a god of something other than God. I can worship the time I spend with God or I can worship God Himself. The distinction is so fine, but also so necessary. Jacob traveled to the same place twice in His journeys and met God there in powerful ways through visions and dreams and conversations with the Almighty Himself. The first time, Jacob fled from His family home in order to avoid the homicidal wrath of his brother, Esau. In the night, after a divine dream, Jacob “called the name of that place Bethel” or House of God. Jacob returned to Bethel years later, after marrying and having children, having his named changed by God, traveling home to Canaan, reconciling with his brother, and settling again in the family land. This time, though, “he built an altar there, and called the place El-bethel, because there God had revealed Himself to him when he fled from his brother” (Genesis 35:17). El-bethel means God of the House of God. Did you notice the slight difference? We love small group, Sunday School, the songs at church, the Christian radio station, a devotional, our quiet times, a particular author that challenges us . . . but are we followers of a Christian lifestyle or followers of Christ? Do we love books by Christian authors more than we love the Bible? Do we love our spiritual routines or the God those routines are supposed to reveal to us? Do we love the feeling of being close to God or God and God alone? There are these life moments when God shakes us up in all of our comfort and complacency and takes away even something good for a time, so that we can worship God and not a spiritual habit. He longs to meet with us during our quiet times and in our prayer closets. He fills us up as we open up The Word and copy verses into our journals. But, He’s there with us at the kitchen sink, too, willing to speak to our hearts as we wash the dishes. He’s with us as we rock the baby in the night and while we pop on the chauffeur’s hat and hop into the minivan to drive children to activities all over town. The distinction between a mundane task and a sacred moment is whether we’re listening to Him while performing it. We should set aside focused time for our relationship with God, and yet we shouldn’t allow it to become formulaic or predictable, nor should it be a compartmentalized part of our life that fails to spill over into our chores and family life. If we do, God will likely stir our hearts and mess with our plans—all to recenter our hearts on Him alone. Are you hungry for a worshipful moment, just the simplicity of seeking after Him? I’ve been singing along with Kathryn Scott the past few days and it’s lifting my heart! I hope you spend some moments worshiping with her, too. I’ve also added a page called Singing in My Car that has links to the songs I mention in the blog. Check out the page and maybe find some songs that encourage you today!